Tips to help you extend the life of your septic system, save on septic tank maintenance costs and protect water quality. Your septic system is one of the workhouse systems in your household. The average home with two baths and three occupants produces over 85,000 gallons of wastewater annually – roughly 250 to 300 gallons per day. Dealing with this is your septic tank; a living filter that separates scum, solids and pretreats wastewater before it flows out into the drain-field for final purification. It takes 24 to 48 hours for this process. Even a good system not cared for may become a neighborhood health hazard and an expensive problem. Failed systems may cause ground and surface water pollution and costly property damage. It is important to maintain your septic system. the soil. A closer look at the individual components can provide context for how to properly care for your system. 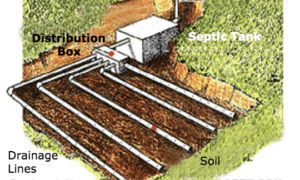 The septic tank inlet pipe – a four-inch pipe is standard – extends far enough under your house to connect with the main soil stack, which delivers waste to the septic tank and also vents system gasses through the roof of your home. The septic tank is a large, underground, watertight container. All of the wastewater and its contents from your toilet, bath, kitchen and laundry flows into the tank. Heavy solids settle to the bottom, where bacteria reduce them to sludge and gasses. Lighter solids such as grease rise to the top and form a scum layer. Solids that do not decompose remain in the tank. If the solids are not removed by periodic pumping (every 3-5 years), they will accumulate and eventually overflow into the drain field, which can cause extensive damage. The wastewater that leaves the septic tank is a liquid called effluent, which moves into the drain field (also called a leach field). The most common of these consists of a series of trenches containing perforated pipe surrounded by septic rock, or gravel, and covered with mesh and dirt. The effluent entering the leachfield/drainfield is partially absorbed into the soil and partially evaporated. If the leachfield/drainfield is overloaded with too much liquid, it will flood, causing sewage to flow to the ground surface or create backups in plumbing fixtures and prevent treatment of all wastewater. The effluent trickles out of the pipes, through the gravel and into the soil, where it percolates and provides final treatment by removing harmful bacteria, viruses, and nutrients. Suitable soil is necessary for successful wastewater treatment as the filtering action of the soil, combined with further bacterial action, removes disease organisms and treats the harmful material in the effluent, completing the treatment process so that the water is recycled to the surface or groundwater source. Typically, septic tanks should be pumped every 3-5 years. But that doesn’t mean you should wait three years to check on how your tank is doing. Once a year, inspect the tank yourself or have a septic tank technician check the levels. Also, periodically inspect the drain field areas for odors, wet spots or surfacing sewage. State and County regulations may require inspections more frequently on some systems. There are two key determining factors we look for when determining whether a tank needs to be pumped, which focus on the scum layer and sludge layer within your tank. We recommend most homeowners employ an experienced and certified professional to conduct these tests but if you are feeling adventurous and up to the task, here is a breakdown on each of the tests. When the bottom of the scum layer is within 3″ of the bottom of the outlet device, the tank should be pumped. 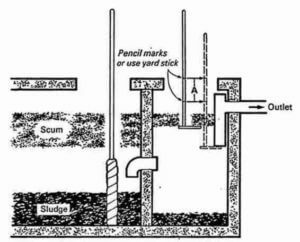 To measure scum accumulation, nail a 3″ square block to a 6′ pole and poke the block through the scum layer. Carefully move the pole up and down to feel the resistance as you move the block up against the bottom of the scum layer. Mark that place on the pole that is level with ground. Then feel around for the bottom of the outlet pipe and mark that level on the pole, if the two marks are 3″ or less apart, your tank needs to be pumped. When the top of the sludge layer is within 12″ of the bottom of the outlet, the tank should be pumped. To check the sludge level, wrap a rag around the bottom 3 feet of the 6′ pole and fasten it with tape. Push the towel down to the bottom of the tank and twirl it. Mark the pole at the ground level. Pull it out after a few minutes and measure the difference between the top of the sludge layer (the top of the black material on the towel) and the bottom of the outlet pipe (marked when you checked the sludge level). If this distance is 12″ or less, have your tank pumped. There are some early warning signs of an impending system failure which you should take note of; while these don’t always equate to system-wide issues they are indications that there might be a problem. If you notice any of the following warning signs, contact a professional septic company immediately for assistance. Odors, surfacing sewage, wet spots or lush vegetation growth in the drain field area. Plumbing or septic tank backups. Remember – once solids have flowed into the drain field and caused damage, pumping the septic tank will not bring a failed drain field back to life. Inspect your system once each year. Pump out your septic tank when needed – generally every three to five years. Keep accurate records. If you can’t remember when your tank was last pumped, your septic system may be living on borrowed time. Keep a diagram of your system’s location and keep a record of system maintenance for future owners. Keep this information in the house. Practice water conservation – the less wastewater you produce, the less strain on your system. Check with a certified septic technician for help with system problems. Now that you understand some of the things you should be doing to protect the your septic system, here are some things you should avoid doing. Don’t place heavy items above your drain field – the pressure from vehicles, heavy equipment or livestock can compact the soil or damage the system pipes. Do not place impermeable materials over your drain field. Concrete, asphalt and plastic prevent oxygen from getting into the soil. Oxygen is needed by bacteria to break down the sewage; grass is the best cover for your septic system. Don’t kill the bacteria in your septic tank – drain cleaners, floor cleaners, paints solvents, waxes, polishes, coating or strippers may destroy important bacteria in the septic tank and contaminate ground and surface water. Don’t dispose of water from hot tubs (spas) into the system – the large volume of water will overload the system and the disinfectant in the spa water can destroy important bacteria in the system. Don’t channel roof, driveway or patio runoff water into your system – excess water can overwhelm the drain field, causing irreversible damage. Don’t over use septic tank additives – they may provide a short-term benefit but create long-term problems. If used continually these products do not reduce the need for routine pumping. Finally, while this might seem obvious – NEVER enter a septic tank – Poisonous gases or lack of oxygen can be fatal. Any work to the tank should be done from the outside. If you have any questions about your current septic system or believe you are in need of a cleaning, please contact us.